Source: The current track. The input clip that determines the glare locations and colors. Scales the color of the glares. 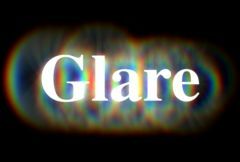 The colors and brightnesses of the glares are also affected by the Source input. Threshold Blur: Default: 0, Range: 0 or greater. Size: Default: 1, Range: 0 or greater. Rotates the ray elements of the glares, if any, in degrees. This parameter can be adjusted using the Rotate Widget.